Post natal depression or the baby blues is common within the first 5 – 8 weeks after having a baby. Feelings of sadness, guilt, depression and sometimes feeling like you wish you had never had a baby are common. We are experienced in treating this at The Blue Tree Clinic and offer treatment for new Mums. Post natal depression occurs in women after they have had a baby. These women will experience low moods and depressive symptoms in daily life as well as towards the child. These depressive states can cause the women to struggle with looking after the child as well as struggling to carry out basic everyday tasks. It is important to note that fathers can also suffer from Postnatal depression. It is important that individuals with Postnatal depression seek help as it is important that the depression does not affect the baby and the relationship between the parent and child. What are the types of Postnatal depression? Simply talking about your Postnatal depression may be an extremely effective way of overcoming your Postnatal depression. Therapy can allow you to express your problems whilst finding ways to help resolve them. Therapy has been found to be highly successful in helping individuals who suffer from Postnatal depression. Types of therapy offered for Postnatal depression at The Blue Tree Clinic? It may be that our team believe you would benefit from medical help as well as therapeutic help in which case we may suggest private psychiatric treatment where a psychiatrist will assess you and decide whether physical tests or medication would help. It has been shown that antidepressant medication can help individuals who suffer from Postnatal depression. Our specialist at The Blue Tree Clinic know how exciting it is to have a new baby however we also know the negative emotions, worry and anxiety it can bring. Our therapists want to make sure that the happiness of having a baby is restored and the negative feelings eradicated. When you come to us our therapist will assess you to ensure we can give you the best possible treatment, whether this be a single therapy type of a variety of several therapies. Your therapist will then look into investigating the underlying causes of your Postnatal depression as well as looking at what the day to day triggers are. 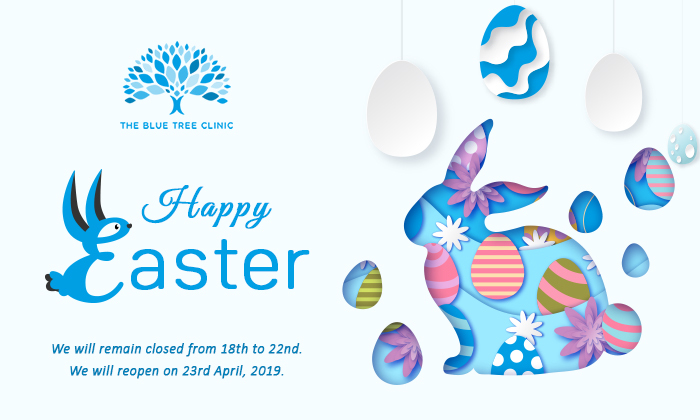 Our job, at The Blue Tree Clinic is to make you feel like you can continue with life in a normal way. In order to do this your therapist will teach you tools and techniques which you can apply to everyday situations where you may feel down, and prepare you for when they therapy sessions are complete.